Beautiful Onefineday Frames, tailor made to fit our famous Limited Edition Name Art. 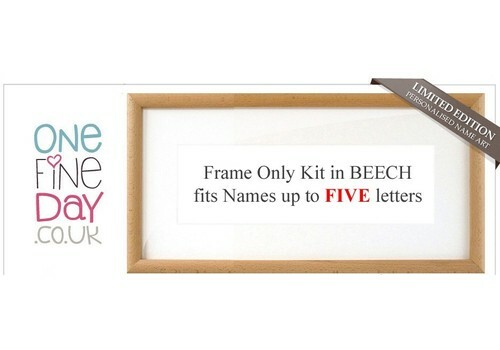 In solid BEECH or WHITE, comes complete with frame, Perspex glazing, backboard and pre-cut Mount to fit Name Art. Easy step by step instructions included for beautiful results. For use with Print Only Name Art. See Artwork and check out our fully Framed Name Art HERE. Please order correct frame size - by number of Letters in Child's Name! 1. On reverse of frame lift backboard tabs with flat head screwdriver or teaspoon. 2. Remove the backboard, barrier card, pre-cut Mount and Perspex glazing. 3. Trim artwork (as shown in printed instructions) align and fix to Mount with paper tape supplied. 4. Peel back film from both sides of Perspex glazing and place in frame. 5. Place mounted artwork in frame - hold artwork against perspex and flip to check if any dust, hairs etc. Wipe perspex to remove if need and check again. 6. Place "barrier card" supplied, behind artwork. 7. Replace backboard and bend tabs back down. Press firmly against backboard with srewdriver/teaspoon. 8. Hang securely on wall via hinged hanger on backboard, or by other safe method of your choice. 9. Stand back and admire....yippee! NEW! FRAMING KIT FOR NAME ART - Artwork NOT INCLUDED. Easy step by step instructions included for beautiful results - see "Framing Instructions" tab above main picture on left. AUSTRALIA, NEW ZEALAND - due to Customs issues we CAN NOT SEND WOODEN FRAMED products - please do not order this product!